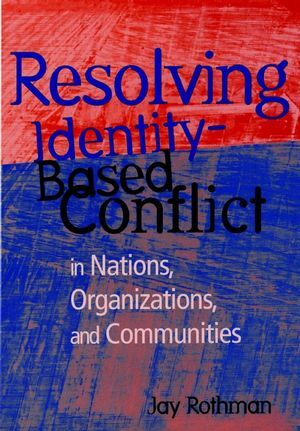 Absolutely essential reading for anyone interested in identity conflicts and how to overcome them. Provides a fascinating theoretical introduction to the phenomena, detailed case study experiences, and a final training guide for practitioners...a landmark work. Presenting a brilliant new approach to conflict resolution that will intrigue and inform practitioners and scholars alike. Writing from his remarkable range of academic and real-world experiences--including his historic work in bringing Israel and the PLO to the negotiation table--Rothman shows how identity-based conflict can be managed so that both parties reach a higher ground than either could have found on its own. His vehicle is his ARIA model, and here he traces the ARIA process through Antagonism, Resonance, Invention, and Action, demonstrating step-by-step how it can be applied in a variety of environments. Complete with field-tested assessment instruments and action plans, Resolving Identity-Based Conflict is a seamless union of theory and practice anyone seeking to turn the passion of conflict into the fuel of creativity can use. Prologue: The ARIA Quartet Conflict. 1. The ARIA Framework: Antagonism, Resonance, Invention, Action. 2. Antagonism: Sufacing Differences and Analyzing Animosity. 3. Resonance: Articulating Common Needs and Motivations. 4. Invention: Generating Cooperative Solutions. 5. Action: Setting Joint Agendas. THE ARIA FRAMEWORK IN PRACTICE. 6. Prenegotiation in Nations: Peace Building in Jerusalem. 7. Transforming Conflicts Within and Between Groups in Organizations. 8. ARIA Tools: Lessons Drawn from Community Conflicts. Epilogue: Engaging Identity, Creating Harmony.